Smoked Salmon Terrine Recipe | Simple. Tasty. Good. Here’s an easy starter recipe! Smoked salmon is a crowd pleaser, sure this smoked salmon terrine recipe will be a big hit on your next dinner party! And it’s a very easy starter to make in advance, something I love when I’m having guests over for dinner! Watch my video of how I’m preparing a smoked salmon terrine in my KitchenAid Stand Mixer Mini. As I said before: you can make this terrine in the morning and after baking just let it chill in the fridge for the rest of the day. Serve the terrine with a small green salad and a couple of slices of toast! Love smoked salmon? Then also check out my smoked salmon roll up! Or how about my healthy smoked salmon salad with avocado, kiwifruit and capers! 1) Chop the smoked salmon up roughly. Then add it together with the cream, the freshly chopped dill and the egg to the bowl of the Stand Mixer Mini. Season with a good pinch of pepper and salt. 2) Attach the wire whip and tilt the mixer head down. Select speed 4. Mix the ingredients for 2 minutes. Then select speed 6 and mix the salmon for 8 minutes. Once finished, tilt the mixer head up and remove the wire whip. 3) Lightly butter 2 ramekins and place them in a small baking dish. Scoop the salmon mixture from the stand mixer bowl into the ramekins. Fill the baking dish with an inch (2,5 cm) of water. 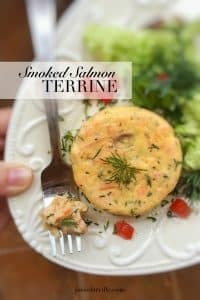 4) Place the dish with the smoked salmon ramekins in a preheated oven at 325°F (160°C) and bake the terrines for about 25 minutes. 5) Once the terrines are baked and set, remove them from the hot oven. Let them cool for 5 minutes. Then carefully flip them over onto a plate. Let the terrines cool down fully or serve them straight away, warm or lukewarm. Serve with a green salad.